Although geared specifically towards a British audience, Duncan Reekie‘s Subversion: The Definitive History of Underground Cinema still has plenty of interesting insights into the evolution of non-mainstream culture to appeal to anyone outside of England who is interested in the underground. Subversion differs from other underground film history books in that Reekie doesn’t deal with films specifically very much. More ambitiously, he’s interested in completely demolishing cherished assumptions about the overall history of British art. In defining the “Underground Cinema” that’s laid out in the book’s full title, Reekie is referring to the culture that surrounds avant-garde and experimental filmmaking, especially how it evolved from pre-cinema days. “Cinema” isn’t just a physical location or the act of sitting in front of a screen watching moving pictures. To Reekie, “Cinema” encompasses the entire engagement between filmmaker, exhibitor and audience, where the lines that separate each of those components are crossed, blurred and — in many cases — completely erased. This concept of cinema — and Reekie’s book — begins in medieval popular culture during which times carnival events engaged the populace by having them participate in and host feasts, games, performances and other activities. These festivities also crossed class lines, with upper and lower classes taking in the fun together. However, as time went on and the bourgeoisie sought to solidify their power, class intermingling was increasingly frowned upon. The open carnivals were restricted to specialized events where strict divisions between performer and audience were actually legislated. While the lower classes constantly tried to figure out ways around the laws so that performers could roam about their performance spaces freely, the bourgeoisie attempted to refine their own culture by making sure all of their entertainment performances were restricted to a stage framed by a proscenium arch in front of which spectators would sit. For Reekie then, the evolution from stage performances to film screenings is a natural one in which a population needs to be convinced that passive spectating is refined and acceptable culture. Film, especially with all of its technology, would seem to naturally encourage a division between audience and filmmaker in its early days. Then, even though film equipment became smaller and more accessible for the average consumer, the damage of division had already been done. You can still see the damage from that division today: The average population is meant to be a passive spectator in a movie theater, enjoying entertainment from “professionals.” Watching films that your friends have made is not considered a valuable endeavor. A population making films and videos is something to be sneered at and ridiculed, even in this day and age of YouTube and Vimeo where it seems just about everybody has uploaded at least one video to the Internet. But, that’s just to “the Internet,” the last resort of crumbum and wanna-be’s. Real professionals get screened in real theaters with stadium seating, air conditioning and, these days, 3-D glasses. Actually, by discussing the Internet, I’m extrapolating a bit from Reekie’s book, which is a good endorsement that there’s real room for thought and further discussion from his ideas. In that regard, Subversion is a real success. However, the early chapters on medieval culture is a bit of a slog to get through for people — like myself — who aren’t knee-deep in academic art and cultural history. But, once Reekie starts putting the pieces together and setting the stage for his actual discussion about modern film, that early slog becomes really worth it. Reekie’s most controversial points are about of British underground film being a wholly owned and operated subsidiary of government cultural meddling. Funding for artistic cinema in the ’60s and ’70s was provided through government agencies and doled out by film historians employed by those agencies. Therefore, the only history of underground film that was ever written was the one written by those specifically doling out the funds to create it. The U.S. never quite had that problem since government funding for filmmaking has always been severely limited. Yet, one can also see a similar act of self-definition within the U.S. underground film world, mostly created by a lack of a diverse set of historians working to formulate a living, breathing history. So, that’s why underground film remains underground: A populace that’s been engineered to not be actively engaged in the production of cinema and a limiting, self-defining exclusionary history. Reekie concludes his book with his most passionate passages. He breaks from the rest of the book’s detached, academic style to recount the very personal history of his own Exploding Cinema collective in London, a group that encourages an open engagement between filmmaker and film watcher. It’s always a difficult battle, though, and it’s good hear tales of how others are fighting their wars — as well as to know how the wars even started. Calling the book a “definitive history” is a bold statement, but Subversion does an excellent job at specifically defining what exactly makes the underground “underground” in the first place. To learn more about the Exploding Cinema collective, please visit their official website. 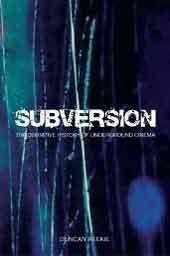 Buy Subversion: The Definitive History Of Underground Cinema on Amazon! and **send us your films**. We are an open screen and show all short films sent – 30mins or less – and we show the rest anyway. Thanks for all the video linkage! Duncan must be modest, he never told me about all of those.